Coordinates with Table Lisp help you while creating setting out drawing , It will create a coordinate table according to the coordinate points placed in the drawing. If need to create some sub points, Type “CSN” to place Increment Coordinate sub Points. 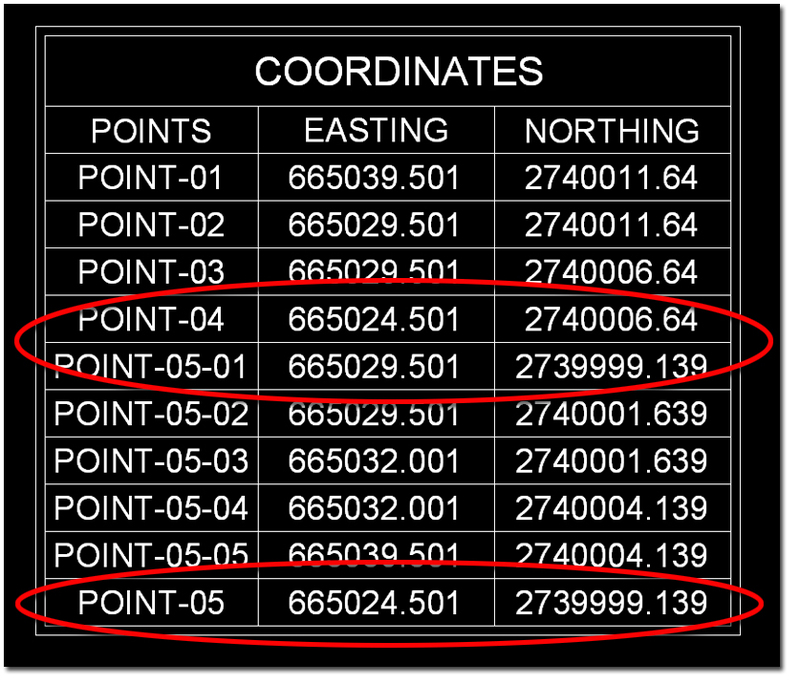 This also allows to create sub points after placing all increment coordinate points. Then Pick a point on your Layout to place table. This will automatically create a table with all coordinates placed under the model space. 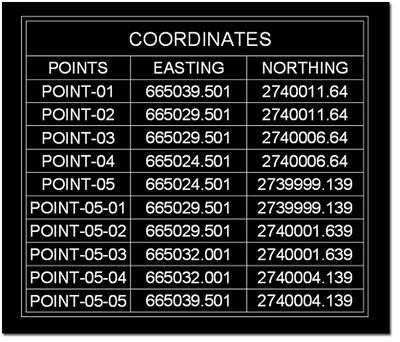 The coordinates table will automatically create the table with an ascending order. Then Pick a point on your Layout to place new table. This newly table will create only those coordinate values of the changed points. And replace the newly coordinates table values with the existing values. This Lisp is crated to place coordinate points up to “99” only, If you have points more than 100, pursue following steps. Coordinate Table lisp will count all “CRBLK” block and extract data of each Block to create Table. Hi Bijoy Manoharan. I can't download the file. It said " you need permission to access this item" . How should I do? Do I have to register some membership of the download site or does it require any password?. Please answer @ teerapat.inarm14@gmail.com . Thanks a lot. Hi, doesn`t work for Autocad MAC 2015?. ya i have it please send your email .. Thank you for the LISP, It was very helpful. 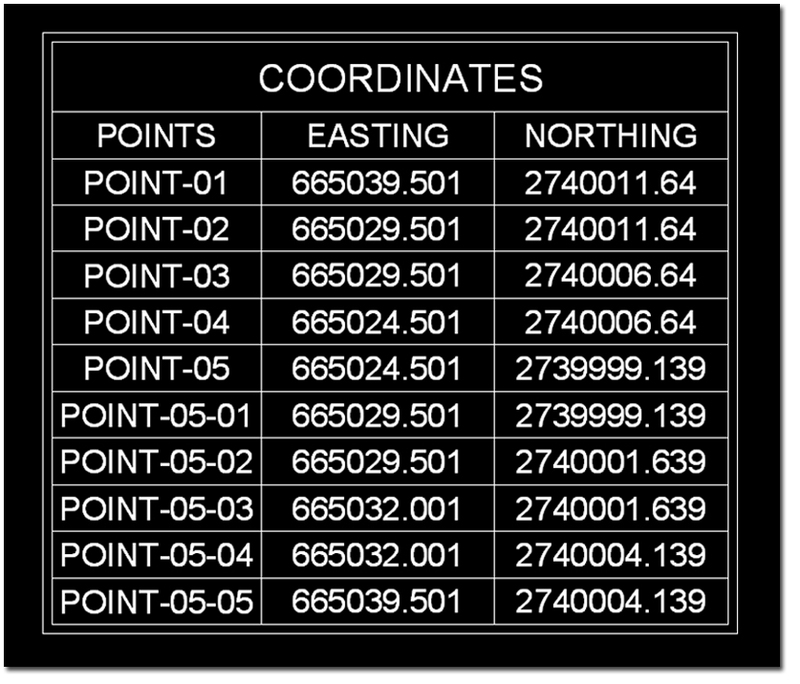 Quick question; I was wondering how I could edit the LISP in order to change the precision of the coordinates in the table, as I would like to display the eastings and northings without three decimal places (i.e. 00000000 instead of 00000000.000). For me it works in 2015 perfectly. I would be nice that code has ability to place the blocks at polyline veritices automatically.Thank you! Hi, doesn`t work for Autocad MAC 2015?. Lisp file is only for windows? Bijoy i am looking for multi line fillet Lisp.you have any Lisp ? Amazing work. I'm trying to find border/titleblock around a survey drawing with the corresponding x-y (Easting/Northing)coordinates displayed across the top and down the left-hand side of the border (looks a bit like some of the standard template title blocks). Anyone know this routine and where I can find it? Is there anything like that but considering the levels of the points rather than coordinates? 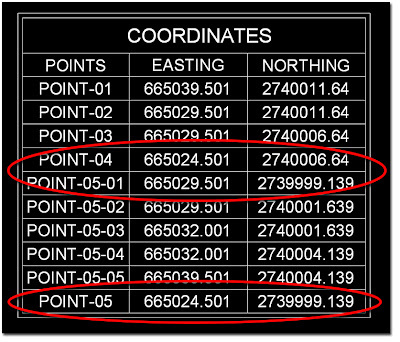 would it be possible to add elevation to the co-ordinates table to produce xyz setting out ? unfortunately it doesn't work and it shows up the following error: "error CLAYER VALUE"
Hi there, I was trying to edit your lisp in order to get points coordinates according to a current UCS rather than the world UCS, but I did not succede. I'm sure it is a very stupid mistake in my code. Would you be so kind to explain how to achieve it? It works really good.Thank you soo much.. I need your help, is there anyway to reduce the amount of decimals that the program shows?? Thanks for the lisp program, very useful for me. Can you tell me how to control precision dimension (i.e)0.000 to 0.0 or 0.00. ITS A VERY GOOD ONE. MANY THANKS BRO.. Thanks a lot man. very useful and simple lisp. Doing so will completely erase all the data and settings from your iPod and essentially give it a new chance at a less problematic life. If only certain aspects of your iPod are giving you trouble such as the applications low level format hard drive, there are several options you can choose from when you restore your iPod that can help you troubleshoot the issue. I have been using your lisp for a number of years now and it works fantastically. I do have a request though, would it be possible to include a X through the centre of the block, rather than the picked point being in the middle of the circle. I have tried to include two lines but my knowledge of lisp isn't so good.